Imagine walking into a beautiful antique shop or the well-appointed home of a collector. That’s what you’ll see when you walk through the pages of this beautiful and well-appointed book. It’s a guide to grouping and displaying your 20th Century collectibles. 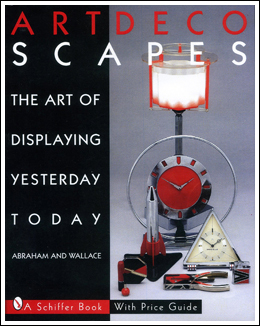 In the first part of the book, over one thousand vintage items are incorporated into Deco-rated tableaux, and then fully described in the accompanying price guide. Groupings by manufacturer, material, color or function are accompanied by diagrams and explanations of the compositions. You can use these as a guide to display and group items from your own collection, whether large or small. The last third of the book features 36 spreads, and brings you behind the closed doors of selected collectors to see how they have incorporated their Art Deco treasures into the interiors of today. Over 150 all new full color photos, 256 pages, HC, 9” X 11”.